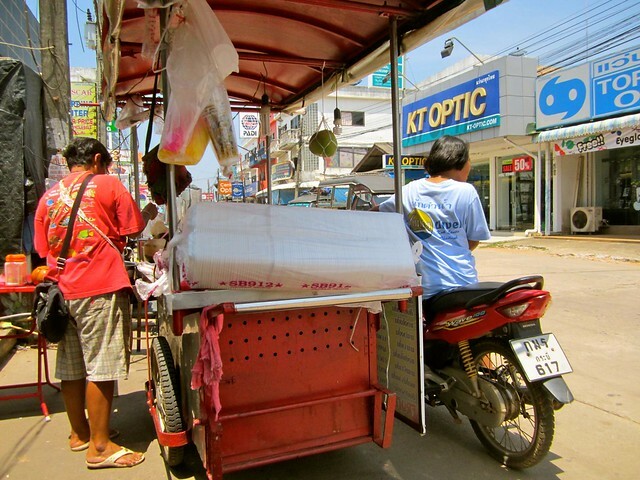 The streets of Ko Lanta are busy with vendors blending up fruit juices for 30 baht. 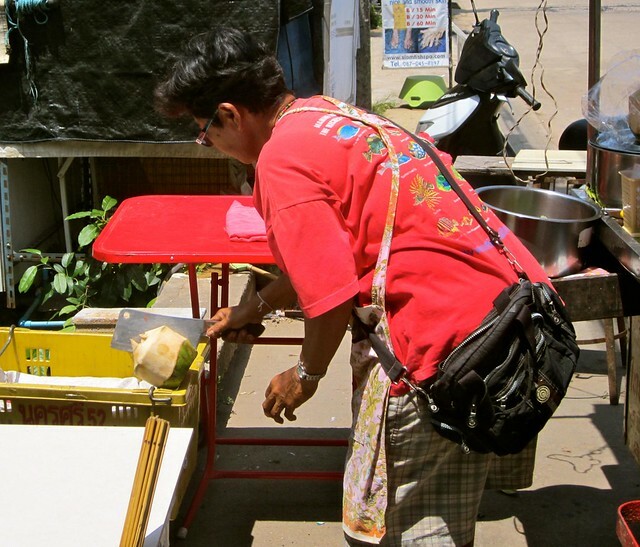 The fruits are ripe and the juice is a refreshing necessity on the 36 degree days. The first day on the island I tasted the heartiest, sweetest all-natural coconut shake I have ever had. I am sure the woman making it didn’t do anything special but I was convinced that no one else would make a shake as good so I continued to return to her throughout my stay on the island. If I went too late she was out of coconuts and I was out of luck, too early and she may not have all of her equipment. On my final day on the island, I made my usual run in the afternoon for a juice and she saw me coming and was ready for my coconut juice order. She looked a bit flustered and when I got up to the stand and informed me she was out of coconuts but not to worry and to wait a minute. After a quick Thai exchange between her and her daughter, her daughter was off on the motorbike I assumed in search of a coconut. Let me point out that we were surrounded by 7-11 and supermarkets that were stocked with coconuts but I am sure there is a market where she can get it much cheaper – so I waited. 10 minutes later her daughter returned with a coconut, her mom hacked it open with a huge knife, stuck a straw in it and proudly handed over a coconut full of coconut water. I smiled and thanked her…except I had really wanted a shake… a sweet blend of the coconut meat mixed with the water and ice (My mouth waters just thinking of it.) She saw my disappointment and without me having to say much at all she said, “You wait 10 minutes”. Once again there was a Thai exchange I didn’t understand, her daughter left on the motorbike and this time I had no idea what she was getting, we had all the ingredients to make my juice in the coconut. I sat down on the colorful plastic chairs next to her fruit stand and waited. She was happy to send her daughter off in order to please a customer, without a hint of frustration or annoyance. The kindness and eagerness to give me what I came for was humbling, I knew at once I wanted to spread her a heart. Her daughter returned 10 minutes later with a blender. I thought, how can you run a fruit smoothie stand without a blender? It must have been a rough morning and she left it at home – no worries, I have had my days and it was here now. She smiled big when the blender arrived dumped the coconut water into the blender and again started hacking the coconut open to dig out the meat. Another 10 minutes, and my juice was blended. I never expected the mother and daughter pair to go through all of the trouble to make me one cup of fruit juice for 50 baht ($1.60). In the end she was happy that I was leaving satisfied and I was happy that I had yet another deliciously fresh coconut juice. The kindness of strangers never ceases to amaze me. Have you ever waited 30 minutes for a certain food that you loved and knew it was worth it?